For the purchase of ZMN Token or any ICO, the buyer is required to thoroughly investigate the tokens and the business which tokens related. 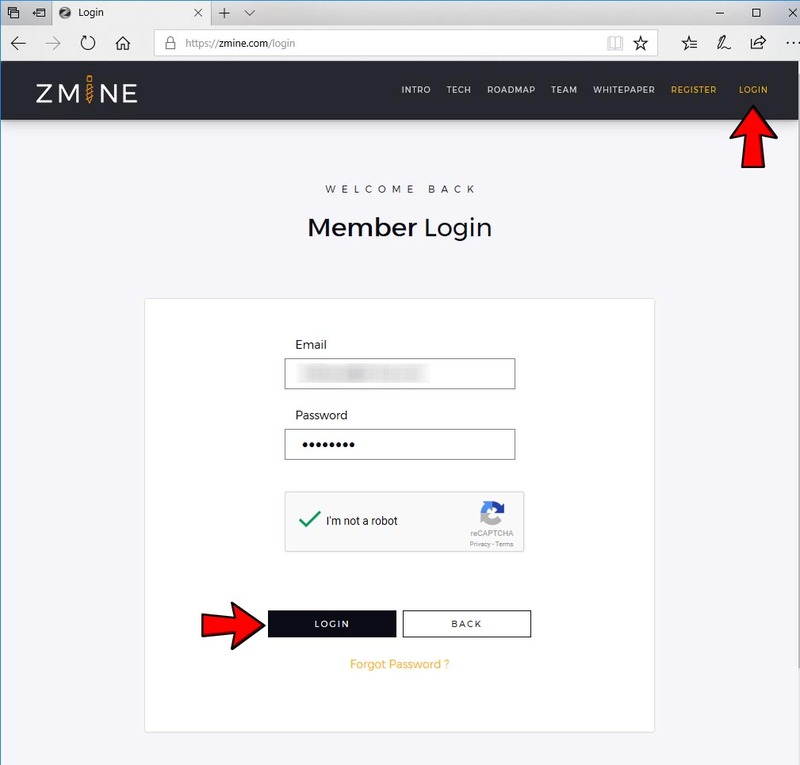 The details of the ZMN Token can be found in the documentation provided below. ZMN Token is a token which is developed on the Ethereum Platform based on ERC20 standard token. The token acquisition is done through a transparent and verifiable called ‘Smart Contract’ system. The ZMN Token specifications are defined as follows. The process of purchasing ZMN Token will follow the standard ICO best practise Procedure. 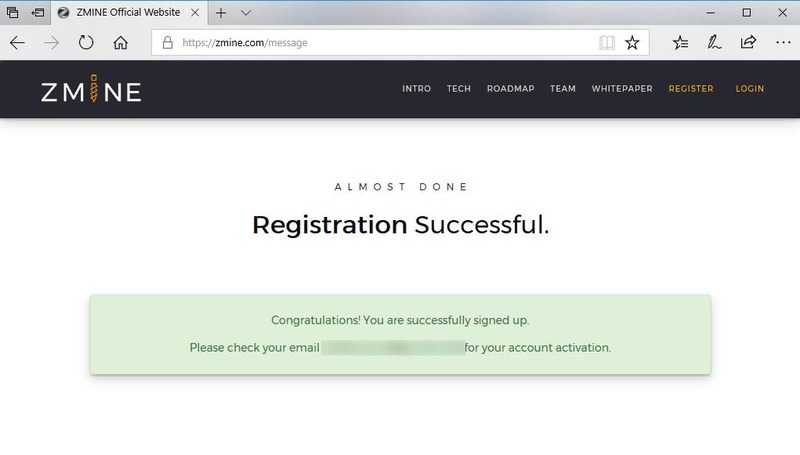 Register and confirm the used email. 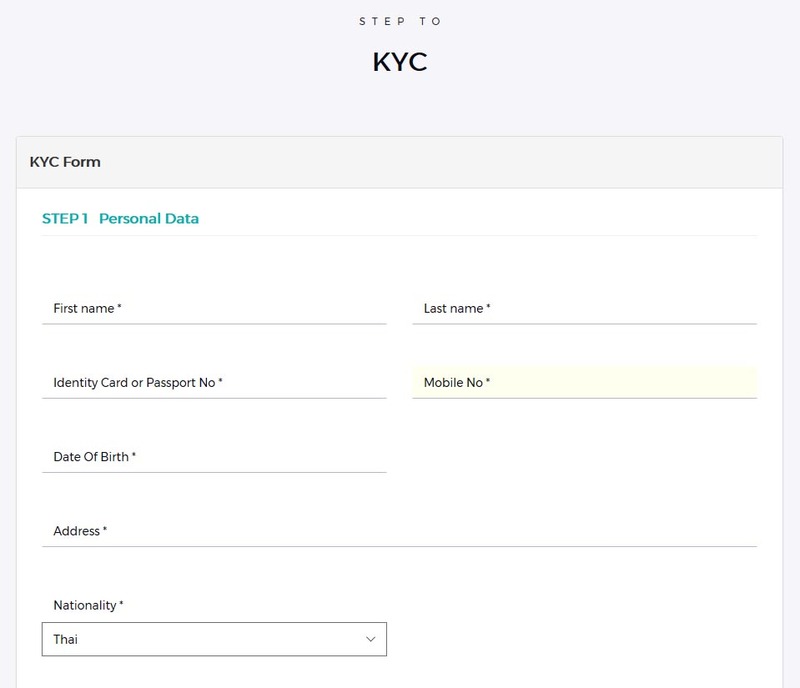 Log in and enter KYC form (Know your customer). Wait for the administrator to confirm the validity of the information. 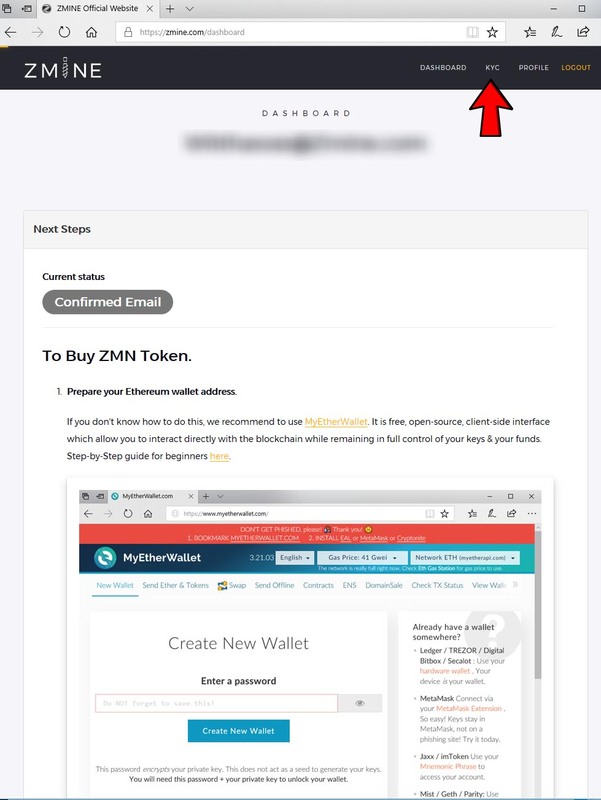 Buy ZMN Token by transferring Ethereum (ETH) to Smart Contract. 1.1 Enter the registration menu from the top right menu. 1.2 If you visit the website via Private Invitation Link, at the bottom left of the website, you will see the word “Private Invitation”. After registration, you will be able to see details of your private purchase, else, just only crowdsale (Public). 1.3 Fill in Email, Password and click ‘Register’. The confirmation email will be sent to the registered email. 1.4 Confirmation message when pressing ‘Register’. 1.5 Email with Confirmation Link. 2.1 Login to the system using top left menu. 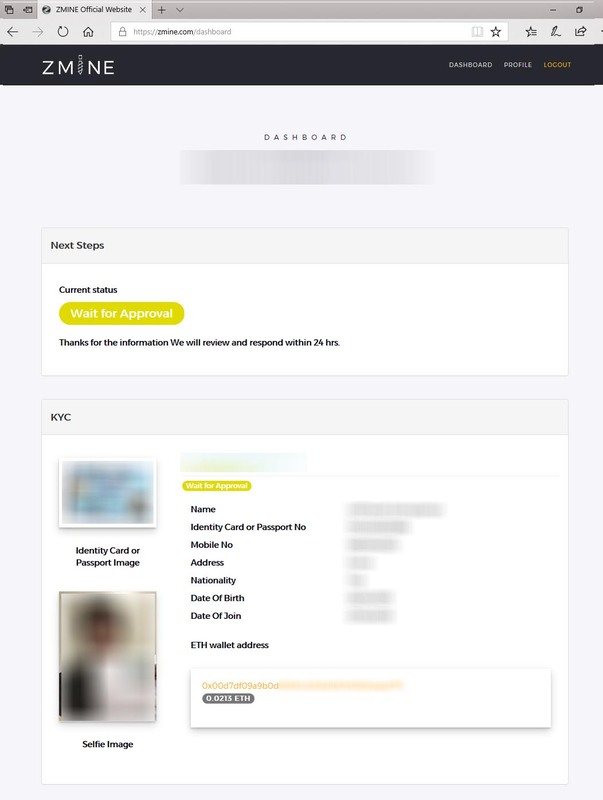 2.2 Upon entering, the system will display the status “Confirmed Email” and provides details to create a Wallet Address, After completing, proceed to enter the KYC form in order to confirm your identity. 2.3 Fill in the Identity card or Passport No. field. It can be used for either ID card or Passport, but the information must match the photo uploaded in STEP 2. 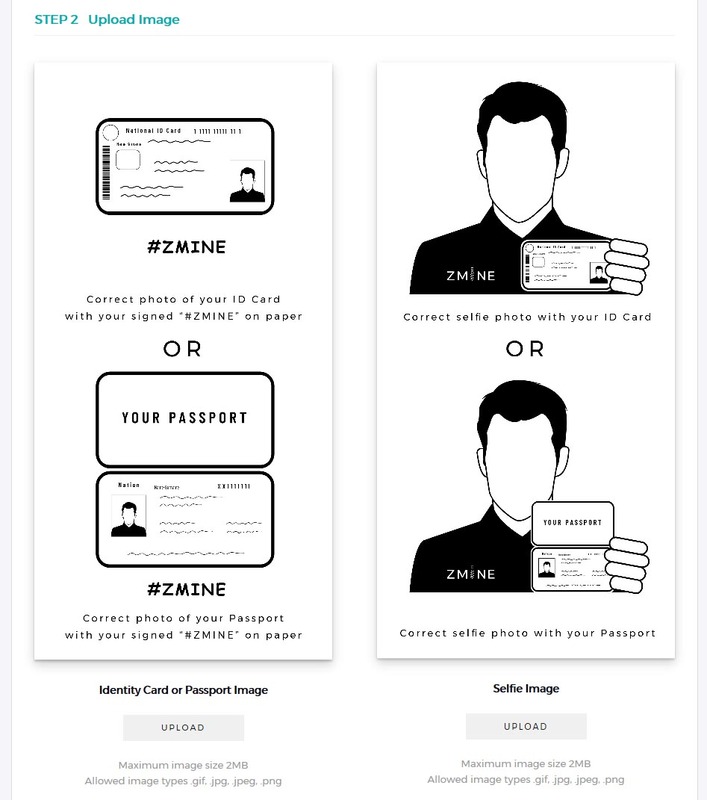 2.4 Upload two pictures; the photocopy of the ID card or passport with “ZMINE” and self identification signed, and self portrait with ID card or passport. 2.5 In STEP3, input the Ethereum Wallet Address for ETH transfer and get ZMN Token transfer from the Smart Contract. Do not use the wallet provided by exchange website. If using the exchange website wallet, the token will be transferred to the exchange website owner’s wallet. After completing the information, press ‘SUBMIT KYC FORM’ to send the information. If you still could not finish them, you can press ‘SAVE AS DRAFT’ to save your temporary data and complete them afterward. 3.1 After the submitted information has been received, the status will become ‘Wait for Approval’. 3.2 After the confirmation and verification of information, the status will become ‘Accepted’ and show the purchase details given below. 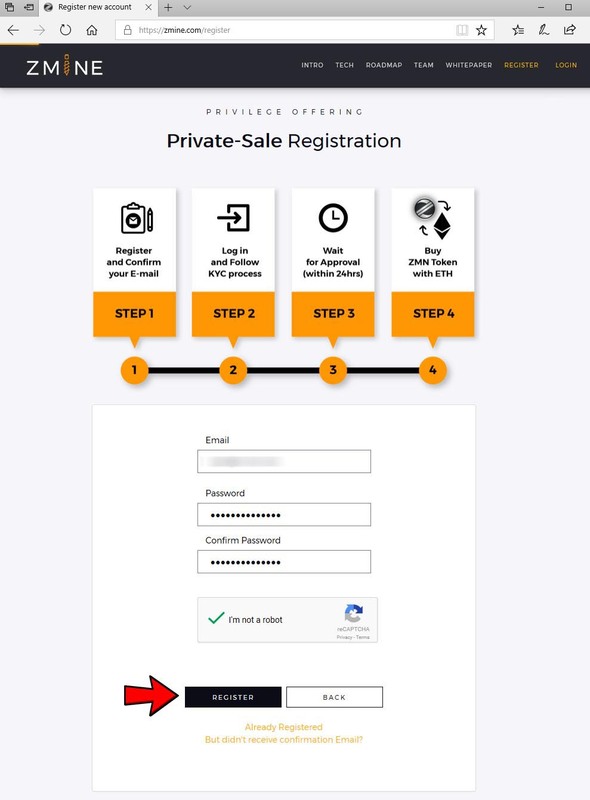 Private-sale Contract Address for ETH transfer to buy Private-sale tokens is available only to those who subscribe via private invitation link. 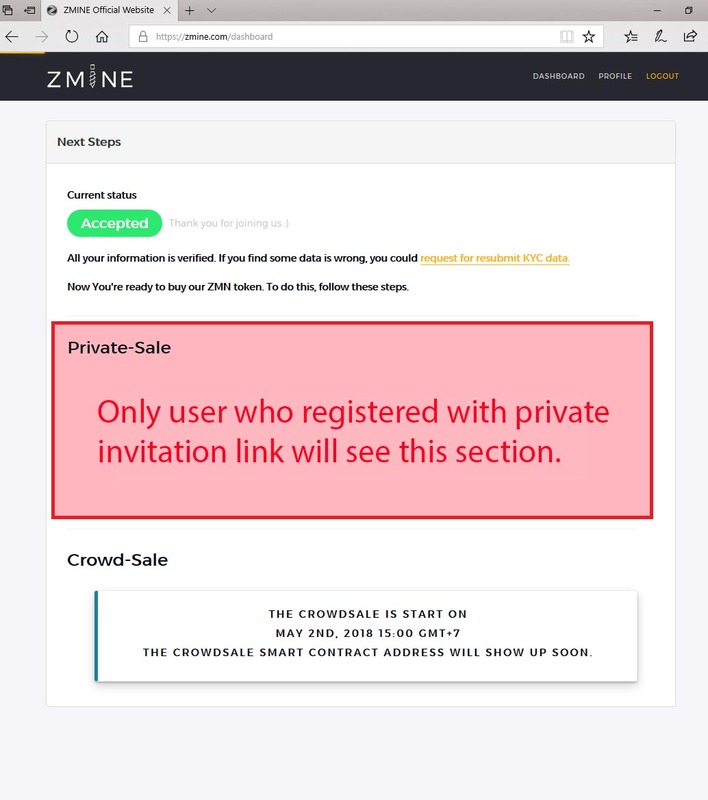 Crowd-sale Contract Address for ETH transfer to buy a Crowd-sale (Public) token is visible to everyone. Crowd-sale contract address will be available before May 2nd 2018. 4.Buy ZMN Token by Ethereum (ETH) transfer to Smart Contract. 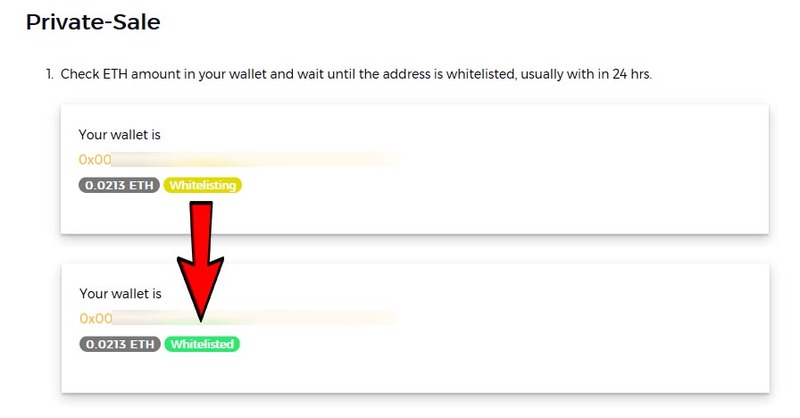 4.1 After approval, the system will display the ETH Wallet Address and Whitelist status until it shows ‘Whitelisted’ which means that the wallet has been approved to transfer funds to the Smart Contract. 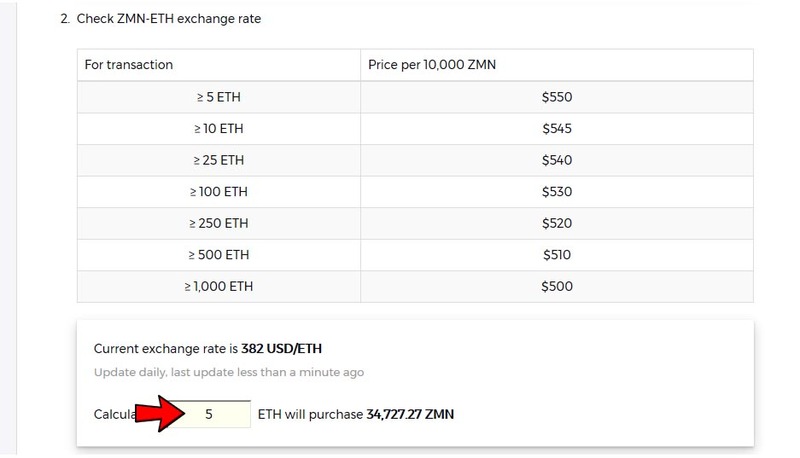 4.2 Check the exchange rate because the ZMN Token will have a selling price based on USD, but since the Smart Contract purchase will have to be transferred by ETH, the exchange rate ETH/USD is constantly changing. 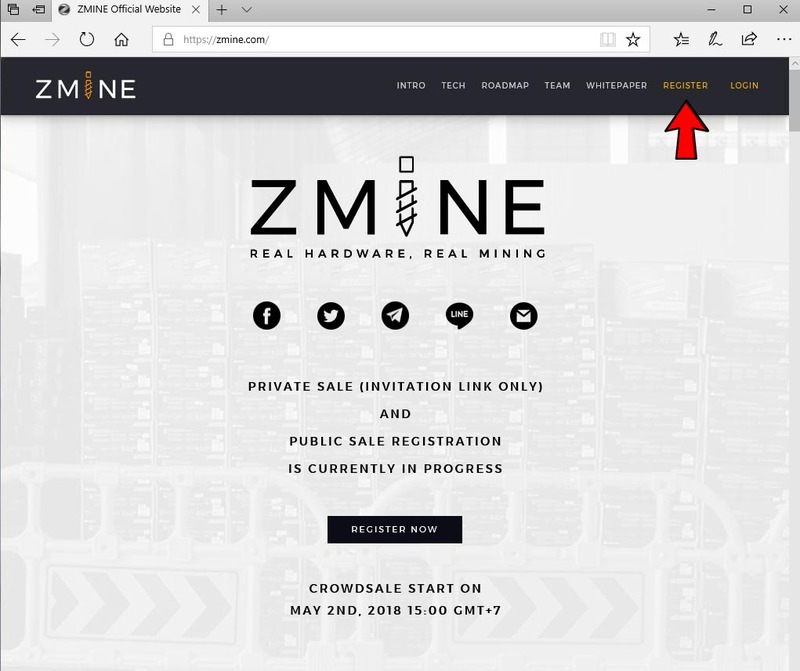 The ZMN Token’s Smart Contract is updated daily. The latest exchange rates are shown to investors. 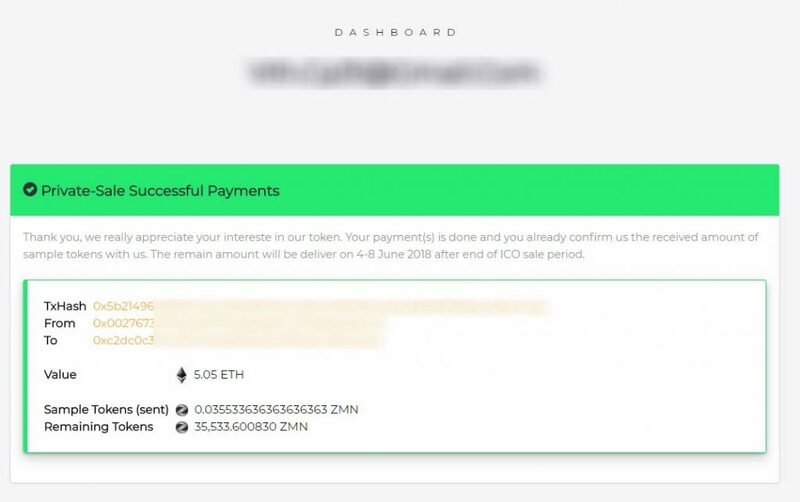 It also helps to calculate how many investors will receive ZMN from the transferred ETH. 4.3 Transfer the ETH to the specified address mentioned, from the sample, as a Private-sale Contract Address (see only those who apply through the Private Invitation Link). The Crowd-sale Contract Address will be displayed in a different wallet address. 4.5 Once confirmed, the administrator will notify the investor via reply email and on user’s dashboard. Transfer of the remaining tokens will be made during 4-8 June 2018.